Jenkins is a continuos integration software designed to run tests and compile projects and providing lots of meaningful metrics over test and compilation process such as test coverage, coding style and such things. Among other features it’s possible to integrate it with several VCS, to ensure you can test every new piece of code. Few weeks ago, I migrated the repository of the software project I’m most involved from Subversion to git. To make a long story short, the reasons were mainly the branches support. 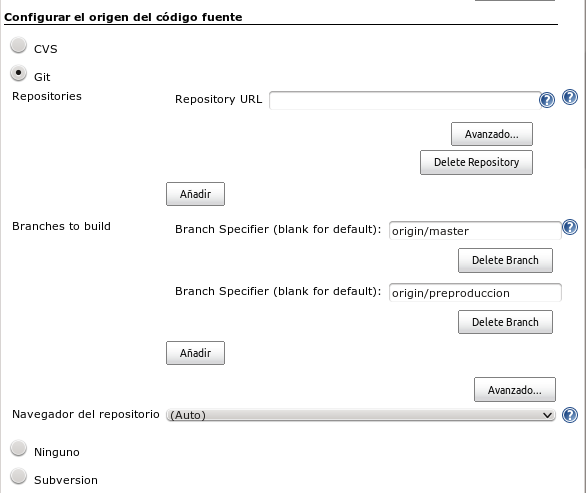 Now I need to make Jenkins use the git repository instead of Subversion one. This is pretty simple. In my installation, Jenkins runs under its own user, which is jenkins. So first of all you need to become that user and create a new ssh key for it. Your identification has been saved in ~jenkins/.ssh/git. Your public key has been saved in ~jenkins/.ssh/git.pub. They passphrase should be empty. The next step is to give read access for the repository to that ssh key. That’s beyond the scope of this post, as it depends on the git server that you are using. You need to add the git host to the known hosts file. The simplest way to do this is just connecting throw ssh using the jenkins user. That way we also test the ssh key is working, and the ssh key is in the authorized keys on the server side. jenkins@ubuntu:/tmp$ git config --global user.email "jenkins@your.server.com"
jenkins@ubuntu:/tmp$ git config --global user.name "Jenkins CI"
The last step is to setup that repository in your jenkin task. Although I’m not a DBA, from time to time I do some DBA tasks. I decided to include them here. To manage these files you should do it from a tool called “adrci”. Here is how I did the purge, after having a look to the policy used. On the Jasig CAS side, I have some upgrades to do, and also some challenges to face. Jasig CAS has a problem with the documentation. It symply doesn’t exists. The documentation is maintained separated from source, and they don’t have any QA process on it. I manage a custom deployment with a custom theme, and custom authentication handlers and repositories, to support spanish DNIe. To do this I need a custom login-webflow, so every new versión I need to figure out what changed to incorporated it into our login-webflow. With the source in Github the best way to do this is using “history” on the login-webflow of the project. I often need to expose user data through Web Services to other apps. Depending on the nature of the user data exposed this has some security concerns. My challenge regarding Jasig CAS is to include in the attributes some ones gathered throw web services. Doing this way I ensure the user data are exposed when the user is logged, so I have a point, a crazy developer won’t be able to poll the entire user database. On the other hand the Django project has tons of things to do. The upgrade work is a continuous task, because I use so many libraries, that they are always getting security upgrades. This project is being developed in an internal svn repository. I want to move the project to git, mainly because I want to use feature branches to avoid hot fixes issues. I’m using jenkins to tests the test, although our test coverage is not that high now. I would like to publish this project in github too, my boss used to agreed me, but he always said we need to improve the project to publish it “finished”. I convinced him that developing in github is a good idea, because if no one gets involve then I won’t be slower, but if some one gets involve I’ll expend some time in managing his/her collaborations, but also won’t expend time actually doing what he/she commited. You are currently browsing the Esauro Tech blog archives for September, 2012.